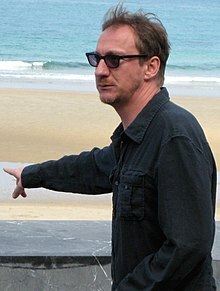 David Wheeler (born 20 March 1963), better known as David Thewlis, is an English actor, director, screenwriter, and author. He first rose to prominence for playing Johnny Fletcher in the film Naked (1993), for which he won the Cannes Film Festival Award for Best Actor. His most commercially successful roles to date have been of Remus Lupin in the Harry Potter film series and Sir Patrick Morgan/Ares in Wonder Woman (2017). Other notable film appearances include Dragonheart (1996), Seven Years in Tibet (1997), Kingdom of Heaven (2005), The Boy in the Striped Pyjamas (2008), War Horse (2011), The Theory of Everything (2014) and Anomalisa (2015). Thewlis has combined major motion picture work with prominent television roles, including portraying Cyrus Crabb in the ABC miniseries Dinotopia (2002) and V. M. Varga in the third season of Fargo (2017). Thewlis was born David Wheeler on 20 March 1963 in Blackpool, Lancashire, the second of three children of Maureen (née Thewlis) and Alec Raymond Wheeler. Both parents worked at his father's shop. As a teenager, he played in a rock band called QED, and played lead guitar with a punk rock band called Door 66. He was educated at Highfield High School, a state secondary school in South Shore, Blackpool. Later, he enrolled in the Guildhall School of Music and Drama in London, graduating in 1984. Thewlis's breakout role was Naked (1993; dir. Mike Leigh), as the main character, Johnny, a highly intelligent, embittered, rambling street philosopher, for which Thewlis was named Best Actor by the National Society of Film Critics (United States), the London Film Critics Circle, the Evening Standard, the New York Film Critics' Circle and the Cannes Film Festival. That same year, he appeared on television as a sexual predator named James Jackson in Prime Suspect 3, opposite Helen Mirren and Ciarán Hinds. Before that, his first television appearance was in Valentine Park. During the 1990s, Thewlis appeared in a variety of films, mostly fantasy and period, including Restoration (1995), Black Beauty (1994), Total Eclipse (1995) with Leonardo DiCaprio, The Island of Dr. Moreau (1996), Dragonheart (1996), and Seven Years in Tibet (1997), opposite Brad Pitt. He was nominated for a British Independent Film Award for Divorcing Jack (1998), and played Clov in a television film of Samuel Beckett's Endgame (2000). Notable appearances also include Bernardo Bertolucci's Besieged (1998) and Paul McGuigan's Gangster No. 1 (2000), opposite Paul Bettany and Malcolm McDowell. He auditioned for the role of Quirinus Quirrell in the film Harry Potter and the Philosopher's Stone, but the part went to Ian Hart. Despite missing out on the first film, he was cast in 2004 as Professor Remus Lupin in Harry Potter and the Prisoner of Azkaban. He did not have to audition as he was director Alfonso Cuarón's first choice for the role. Thewlis reprised the role in four other films in the series. He appeared as an SS Commandant of a Nazi death camp and father of the main character in The Boy in the Striped Pyjamas, which was well received. Other credits include Ridley Scott's Kingdom of Heaven (2005), Terrence Malick's The New World (2005), and The Omen (2006). In June 2015, Thewlis was reported to be filming scenes for a Donald Crowhurst biopic, The Mercy, on the beach at Teignmouth, Devon, playing Donald Crowhurst's press agent, Rodney Hallworth, while Colin Firth is playing Donald Crowhurst. He also starred in Regression, a thriller released in autumn 2015. In September 2015, Thewlis starred as Inspector Goole in Helen Edmundson's BBC TV adaptation of J. B. Priestley's An Inspector Calls. In October 2015, he played King Duncan in the film Macbeth. Thewlis portrayed Ares in Wonder Woman (2017), the DC Comics film featuring the character of the same name. He briefly reprised his role as Ares in Justice League (2017). In 1992, Thewlis married director Sara Sugarman; they divorced in 1994. He then had a brief relationship with Bill Oddie's daughter Kate Hardie. In 2001, he began a relationship with actress Anna Friel, whom he met on a flight to Cannes. They have one child together.Their daughter is called Gracie Friel. She was born in 2005 and spent her early years as an actress. Friel and Thewlis ended their relationship in late 2010. All the Invisible Children Jonathan Segment: "Jonathan"
2007 The Street Joe / Harry Jennerson Episode: "Twins"
^ David Thewlis is the 'Anonymous' actor who's everywhere, Los Angeles Times, 12 January 2012. ^ "Behind The Voice Actors - David Thewlis". Retrieved 5 February 2014. ^ "David Thewlis profile at FilmReference.com". Film Reference.com. Retrieved 30 August 2007. ^ a b c Grice, Elizabeth (4 May 2005). "'Anna has changed me for the better'". London: The Telegraph. Retrieved 30 August 2007. ^ "Up the Elephant and Round the Castle(1983–1985) - Full Cast & Crew". IMDb.com. Retrieved 27 November 2014. ^ Morris, Clint (9 June 2004). "Interview: David Thewlis". Movie Hole. Archived from the original on 26 September 2007. Retrieved 28 August 2007. ^ "PICTURES: Colin Firth and Rachel Weisz on a Teignmouth film set". Archived from the original on 30 June 2015. ^ Mendelson, Scott. "Gal Gadot Releases First 'Wonder Woman' Image While Warner Bros. Announces The Cast". Forbes. ^ Osborn, Alex. "Wonder Woman: Harry Potter Actor David Thewlis Reportedly Cast as Villain Ares". IGN. ^ MacDonald, Marianne (26 September 2005). "Post-natal confession". The Daily Telegraph. London. Retrieved 25 April 2010. ^ "Friel, David split after nine years". Digital Spy. 14 December 2010. Retrieved 26 December 2010.